1 FULL week of August’s Daily Reading Comprehension is FREE forever with this download. 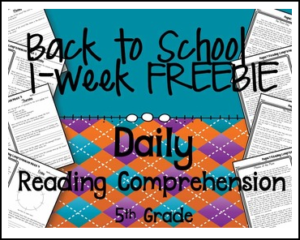 Enjoy 1 week of daily reading comprehension worksheets for 5th grade. Thinking of buying a full month (or more) of daily reading comprehension activities? Check this out and give it a try in your classroom before you commit! This week-long activity is a fictional story about going back to school. Written on a 5th grade reading level, it is perfect for daily morning work or homework. Great for standardized test prep, these passages have the feel and re-reading of a close read with more structure. Questions are grouped by type so that students focus on one main skill a day. Monday – students read the passage and answer questions about main idea, theme, and the general form of the text. Tuesday – students re-read the passage and answer multiple choice, standardized-test styled questions. Wednesday – students re-read the passage and answer character or setting questions about the text. Thursday – students re-read the passage and answer GUM (Grammar, Usage, and Mechanics) questions about the text. Friday – students re-read the passage and answer short-answer, written response questions about the text. Like what you see? All of August & September are available now, with other months coming soon!